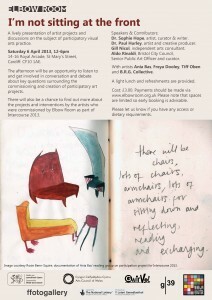 I am a speaker at this event, on Saturday 6 April, 12-6pm; looking at participation. I plan to talk about where participatory projects are placed or perceived within the art world; alongside the language used to describe projects and the impact of this. Looking forward to it! See here for more info.